Novotel Bangkok Bangkok Bangna offers all the superb facilities, exemplary service and luxuries, which is why it is one of the finest hotels in Bangkok and it is near “BITEC”, the biggest convention Centre in Thailand. Each of the Hotel’s 284 rooms perfectly blends clean modern style, allowing you to unwind in an atmosphere of unmatched calm and relaxation. 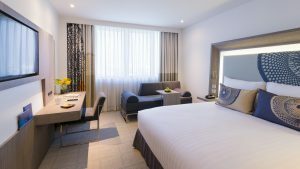 All room features the fullest range of contemporary comforts, including complimentary Wi-Fi, modern furnishings, large LCD TVs and bright, stylish, bathrooms. Dining options, which offers something to suit every taste, includes the “Deli Shop”, “The Square” restaurant and “Shui Xin” Chinese restaurant, Novotel’s dining concepts that serve superb local and international cuisine. We also have “The Bar”, which is located at the ground floor with live music performances from Mondays through Saturdays. The hotel’s meeting facilities are perfect for every type of occasion. It provides cutting edge technical equipment, professional planning, and catering services. Meeting rooms include a large Ballroom, the newest TANA function room with natural daylight that can accommodate for up to 450 people and plus 10 additional Meeting Rooms of function space. The friendly and dedicated staff of Novotel Bangkok Bangna is looking forward in welcoming you and will ensure that you receive the impeccable service and comfort that every Novotel is known for around the world!